Unfinished Conversation is a wonderful and heartfelt book. You have put together an invaluable resource for people who have gone through similar painful healing journeys. With gratitude and admiration for all of your incredible work in the world. — Angeles Arrien Ph.D., Cultural Anthropologist and Educator, author of The Four-Fold Way and The Second Half of Life. —Beverly Cobain RN, author of When Nothing Matters Anymore and co-author of Dying to Be Free. Her cousin, Kurt Cobain, lead singer of the band Nirvana, died from suicide in 1994. Author of Buddha’s Brain and Hardwiring Happiness. Unfinished Conversation is a wonderful book that offers a practical pathway through grief to healing for loved ones, grief support groups, and the healing professionals who support them. Unfinished Conversation: Healing from Suicide and Loss begins with an invitation to take a journey into the pain of loss. This journey, the authors claim, will lead through the heart of the pain and help to heal shattered hearts and to develop a new relationship with the one who is now gone. The base of the book is taken from a journal that Robert Lesoine kept after the death of his friend, Larry. Expertly woven into the raw feelings expressed in the journaling of Lesoine’s loss are the tools and techniques of Marilynne Chöphel that will help to understand, heighten, experience and refine these emotions. The authors claim this journey will help anyone left after a suicide find greater perspective, meaning, and well-being in their lives. I agree without reservation. When I began reading the book, I will admit that I was skeptical of the authors’ claim as I felt that I was being sold. However, the willingness of Lesoine to share his feelings in such an honest and sometimes vulnerable manner disarmed me. I connected with experience in a way that made differences in vocation, stage of life, or spiritual views irrelevant. Themes of Lesoine’s own experience of spirituality are prevalent in the book because they were prevalent to him; not because the authors were trying to tell me they should be prevalent to me as I had feared initially. In fact, it is because of these shared spiritual experiences—though different than my own—that I was able to connect so deeply with the book. The guided journey in this book begins with an account of Lesoine’s experience of learning of his friend’s death. While the chapter acts as a preface for the following chapter—regarding shock and disbelief—it also gently invites readers to reconsider “getting over it.” Readers are invited to turn towards their pain and accept that a certain amount of grief may always be present but that it is possible to feel whole again. After this discussion of grief and shock, the authors then guide readers through feelings of responsibility, unanswered questions, feelings of abandonment, and many more common experiences after suicide. Each chapter has questions designed to develop a further understanding of the experience of loss, sometimes to heighten the feelings, and also to bring the readers back down to earth. 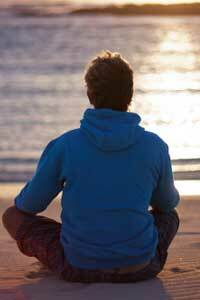 It is very worthwhile to note that with every exercise readers are invited to return to the present moment and be grounded. These exercises are valuable tools to cope with difficult emotion. As the book begins to close, readers are assisted in findings ways to remember their loved one but also to say goodbye as Lesoine says goodbye to Larry’s dog that served as a great connection and keeps Larry alive. The book also includes six appendices that are all extremely useful resources for this journey of healing, creating support, and for suicide prevention. Unfinished Conversation: Healing from Suicide and Loss is a book that I will use in my own clinical practice and one that I will recommend to friends and family as well. The book helps to create some understanding out of an experience that is largely devoid of it. Most importantly, the book helps to believe that there really is hope that it gets better. 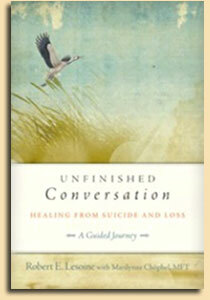 As a trauma psychotherapist, I so appreciate Unfinished Conversation: Healing from Suicide and Loss – A Guided Journey. This book offers itself not only as a resource but also as a companion, guiding the journey of loss from a loved one’s suicide. Written in short chapters that open with a personal narrative about author Robert Lesoine and the death of his best friend Larry, it is written in an accessible, engaging way that supports the reader in understanding some of the themes unique to this kind of loss. Each chapter walks the reader through journal exercises to help create meaningful closure and healing around the gaping wound of a sudden devastating loss. Although the American Foundation for Suicide Prevention documents twenty-five reported suicides a day in the U.S., we often feel isolated in the wake of a suicide loss. Early chapters of the book look at the ways in which a suicide leaves us with feelings of “unfinished business,” such as disregarded warnings and an incompleteness that comes from unanswered questions. Each chapter ends with a simple exercise to return to the present moment. We have a chance to write an uncensored eulogy, sit with the positive and negative influences of this person in our life, explore our loved one’s shadow (and our own), and reflect on dreams in which we are visited by the one we lost. The way we choose to respond to suicide determines the quality of our consciousness as we make our way. Unfinished Conversation helps us see how to make choices that can heal us from the devastation of suicide with meaning and grace. I’ve recommended many books in the last year as particularly powerful and pithy resources for recovering resilience. This month’s e-newsletter focuses on a particularly poignant as well as powerful and pithy book: Unfinished Conversation: Healing from Suicide and Loss – A Guided Journey. It takes real courage to acknowledge, talk about, read and write about suicide. Written by my esteemed colleague and friend Marilynne Chophel MFT, and her esteemed colleague and friend Robert Lesoine, Unfinished Conversation offers a guided journey to healing from grief and loss based on Robert’s experience grieving the loss of his best friend Larry to suicide. I was present the evening Jack Kornfield and Pema Chodron were interviewed by Michael Krasny about compassion from the Therevadan and Tibetan points of view. 3,000 people were in the auditorium. When audience members were invited to ask questions, a woman stood up and asked how to cope with the suicide of a loved one. A hush fell over the entire auditorium. Jack asked anyone who had also lost a loved one to suicide to please stand up. 300 people stood up. Jack asked the woman to look around and see how many people, in this one auditorium on this one evening, could understand her pain from their own pain, moving from the “me” to the “we” to keep our hearts open in the face of our own suffering. Over one million people worldwide choose to take their own lives every year; that’s one death every forty seconds; more deaths per year than lives lost to homicide and war combined. The annual number of unsuccessful attempts is far greater. The largest increase in rates of suicide (30%) is now among people 55-64 years of age. Yet there is a pervasive stigma attached to acknowledging any mental illness associated with suicide, including depression, which can prevent people from seeking help, and a powerful stigma attached to talking about, contemplating or recovering from the loss of a suicide. May these reflections and exercises be useful to you and yours. First Reactions….Telling Others….Remorse and Regret….Creating a Place of Honor….Gathering to Say Farewell….Creating Dialogues….Talking about the Hard Stuff….Unfinished Business….Grieving Around Strangers….Being In-Between….Gifts of the Shadow….The Uncensored Eulogy….Defining Moments….Turning toward Acceptance….Forgiveness….Ongoing Conversation. Larry was not a coward; he was not selfish; he was tired. He was in the profound pain of an illness that often allows for no hope and blinds one to the love of self and, most cruelly, insists that there is no help anywhere to the sheer fatigue and loneliness that envelops those lost in its embrace. In conversations after the memorial service with the new love of Larry’s life, Kathryn, Robert was able to put together the missing pieces of the puzzle of the dust balls and cobwebs of the depression and physical pain, fears of inadequacy, and anger masking those fears, that blocked the light and love from Larry’s mind and heart that might have allowed him to go on living. Chapter 16, Missing Pieces, is a moving conversation with the reader of Larry’s unraveling from hope and joy into dark despair again. Understanding the pain of Larry’s depression and estrangement cracked open Robert’s heart to understanding, compassion, and forgiveness. Even so, there were waves of powerful emotions to manage as Robert moved through his own bardo. In the Tibetan Buddhist tradition, the bardo is seen as a transitional state between death and life beyond death. Robert’s bardo was the transition from the life he knew with Larry to a life without him, letting go of the dreams, the possibilities, the conversations, letting go of beliefs about how life is supposed to be. Transitioning to a deeper understanding of the light and shadows of life to a new way of being with himself, with memories, with a sense of Larry’s presence within. The latter third of the book describes the journaling of conversations, retreats, and ceremonies in the Lost and Found men’s group that were turning points in understanding, coming to terms, acceptance of Larry’s path and his final choice. As Robert begins to move beyond Larry’s death to life without him, but carrying his aliveness in his own heart, he could show up in new ways for his life without Larry, unfolding the path he must now travel without his best friend. The unfinished conversation becomes a series of ongoing questions about the meaning of life and responses to mortality. November 23, 2013 is International Survivors of Suicide Day. For one of the most beautifully moving 9-minute videos you will ever see in your lifetime, click here. Adverse Childhood Experiences (ACEs) provides trauma-informed practices to prevent ACEs & further trauma, and to increase resilience. Robert E. Lesoine’s best friend Larry took his life by suicide on October 15, 2005. Although Lesoine knew Larry was struggling with feelings of disappointment, dejection, and loss, along with the return of debilitating pain associated with a past injury, Lesoine did not see the intensity of Larry’s despair. In his grief, Lesoine, who practices Buddhism, initially planned to write to Larry for 49 days following his suicide. Buddhism claims that during the 49 days following death, consciousness is suspended before incarnation into the next life. What started as a deeply personal effort to grieve and continue his connection with Larry, Lesoine later expanded into a guide for grieving death by suicide, titled Unfinished Conversation: Healing From Suicide and Loss. In this book, Lesoine, along with Marilynne Chöphel, MFT, uses memoir, journaling exercises, and mindfulness practices to guide those who have lost a loved one to suicide towards greater self-understanding and compassion, which often are the hidden gems of the grieving process. Grieving may be one of the most painful and courageous tasks we endure as human beings. Grieving is an initiation into what depth psychologists sometimes call the dark night of the soul, and myths like Persephone’s Journey into the Underworld, and similar spiritual tales, were created to model the inevitability of loss and its cyclic nature, teaching us that although despair and grief are inevitable, they too shall pass. Perhaps the pain of losing someone to suicide is that the deceased was unable to foresee the cyclic nature of suffering. And as suicide’s survivors, perhaps by choosing to accept the natural order of grieving, and being willing to both be with suffering and transform it, the survivor can also transform the departed’s choice of suicide into something meaningful. This, I believe, is one of the central lessons that Lesoine and Chöphel’s guided journey through grief teaches. Yet without a spiritual tradition as a guide through grieving, or a community supportive of life’s inevitable losses, it’s all too easy in our modern world to avoid the journey into the Underworld of despair. Instead, many of us find ourselves stuck in depression or anger or apathy, unwilling or unable to face our own suffering. The emotions that can flood us in the wake of death — shock, sadness, hopelessness, numbness, guilt, anger, even rage — are amplified when death is by suicide, and often complicated further by feelings of shame. Too often, people try to shut down these powerful feelings by rationalizing them, dissociating them, denying them. Although distancing ourselves from powerful emotions is an important and needed survival mechanism, eventually they must be given attention. When grief is unresolved, especially after a tragic loss like suicide, it traumatizes the body, mind, and soul. In the field of psychotherapy, we speak of complicated grief, which feels a lot like acute traumatic stress. Complicated grief is thought to happen when the person who has died is too dead. The felt need to push away painful and overwhelming emotions halts the grieving process. Healthy grieving is not as much about forgetting the deceased as remembering them differently, and thus starting a different relationship with them, one that involves death as part of the story we tell about who we were in relationship to the deceased, and who we have now become without them. This story we tell to ourselves, to others, and in our “unfinished conversation” with the departed. The power of Unfinished Conversation is Lesoine’s willingness to continue the conversation with Larry, to honestly and openly engage with the emotions and fantasies pouring forth, filling the void his friend’s death created in him. Had Lesoine shared only his imagined conversations with Larry, the book would have been a beautiful memoir and an implicit guide for healing after losing someone to suicide. Yet by providing both journaling and mindfulness exercises in each chapter, readers are guided deeper into their own healing. Each chapter shares from Lesoine’s year following Larry’s suicide, including excerpts from his own journals. Much attention is given to processing difficult emotions and constructively engaging with the inevitable imaginings of the deceased. Lesoine and Chöphel gently lead readers towards a deeper understanding of how loss impacts who they are becoming in the aftermath of suicide while also coming to understand how suicide changes their relationship with the deceased. While Lesoine and Chöphel weave Buddhist beliefs and other spiritual practices throughout the book, they address aspects of grieving that are universal, transcending all spiritual traditions. Each chapter ends with a brief mindfulness practice, which ideally helps readers recenter in the present moment and in the body following potentially emotionally charged writing experiences. Especially through Chöphel’s contributions, Unfinished Conversation has the added benefit of including exercises specifically adapted to the latest research and practices from the field of trauma-informed care. In Appendix A, Chöphel provides an important “Tool Kit For Your Journey To Healing” that I would recommend reading before beginning the exercises. Since the fear of being emotionally overwhelmed often keeps us from exploring difficult material or remembering painful experiences, it’s important to feel emotionally safe and grounded while doing the exercises, thus avoiding the risk of retraumatization. This appendix, along with other useful resources, can be found at the book’s companion website, unfinishedconversation.com, which itself is a wonderful resource. Unfinished Conversation is a deeply personal book and a gentle guide for grieving death by suicide. It’s also a courageous book. Lesoine unflinchingly shares his intimate journey, showing the inevitable pain and messiness that grieving involves, but also the heights of the human spirit that are reached when we are willing to face what frightens us the most. Unfinished Conversation is a handbook and resource book for those who have lost a loved one to suicide. It offers a roadmap for navigating through the very difficult process of great loss, toward the path of transformation and healing. A comprehensive toolbox filled with powerful and practical tools for everyone regardless of where they are in their process or how long ago the loss occurred. This book is a handbook for healing, a handbook for life, that I will refer to again and again through the years ahead with the certain losses that life will bring. Throughout reading Unfinished Conversation, the line, “We arrive at nirvana (end of suffering) by way of moving through samsara (mundane existence, full of suffering and misery)” seemed to fit. The book brought to life the phases of loss and grief described by Elizabeth Kubler Ross, providing a beautiful illustration of moving in and out, and back and forth, through all the phases, giving the reader a sense what each phase looks, feels, and sounds like. It demonstrates how someone can, with self-awareness and consciousness, move through all the phases and move toward healing and wellbeing in their life. It models, with depth and compassion, how to release and discharge the traumatic traces from the past. Not forgetting, but forgiving, and growing in wisdom about the person that has passed – and about one self. Unfinished Conversation is compelling to read, a real page-turner. And it is beautifully written, coming from the heart, with grace, depth, and integrity. The language used makes it very accessible to a wide audience at all ages and stages. At the same time, it is very nuanced and concise with extraordinary clarity, compassion, and honesty. The writing and tools provide an emotional vocabulary and “model” for others in the writing of their journals and letters. Robert’s journey unfolds in a way that feels very real, with each step easy to follow and understand. How wonderful to read about the depth of love two men feel for each other – who are not gay. Robert’s experience through grief is expressed with such authenticity, honesty and vulnerability… and without shame or embarrassment. His level of psychological and spiritual awareness is a role model for men, as well as women. The Preface is very moving, setting just the right tone for the book, and immediately establishing creditability for the authors. I loved the book’s format. It’s very reader friendly. The self-reflective journal exercises are very “do-able” for a wide audience, and the reader can easily pick and choose their own path through the guided healing process. The mindfulness section at the end of each chapter is inspiring, being both a prayer and statement of validation. The appendices are excellent, with the Tool Kit for Your Journey to Healing and Creating Support resources especially helpful. I liked that Larry wasn’t idealized or demonized. Rather, the reader has a very real sense of him and his complexity along with the complexity of his relationship with Robert, the brothers, former partners, and other loved ones. All the characters are extremely well written and come alive with their humanness. The writing demonstrates that forgiveness isn’t about making an effort to “do the right thing” or “let go.” It’s the natural outgrowth of moving fully through a healing process, with no rush or time-table, at one’s own pace of coming to terms with such great loss. The book presents many surprises and delights, even the unexpected sweet relationship with the dog Buddy, demonstrating the healing that is possible with letting go and death. I liked that several rituals, used by Robert as well as the brotherhood of men, are described and provide another kind of “modeling.” The book remains anchored in reality with actual names of teachers and teachings, as well as psychologists, being included in the story. And there is an extensive bibliography, so the reader can further reference those names. There are excellent educational pieces throughout, such as sharing information about how “unresolved grief or trauma from the past also compounds the complexity of your current loss,” and helpful information that guides the reader through the final stages of the transformational healing process. The book presents a perspective and compassion for the person who takes their life by suicide, so we can better understand what happened and why from their experience. This “inquiring into” the loss helps the reader better deal with feelings of anger or judgment about their loved one’s choices and the impact their actions had on him/her self, and the reader. It also keeps open the compassionate perspective and honoring of individual choice. Unfinished Conversation is a reminder that the challenges in our lives, the ones that rock us to our core, have common elements. All involve embracing acceptance, making meaning, finding courage, gaining clarity, tapping our inner wisdom and knowing, and restoring wholeness and integration, as a pathway toward transformation and liberation. Thank you Robert and Marilynne, for bringing this gift of healing to the world. The book, Unfinished Conversation: Healing from Suicide and Loss, is about one of the most deeply painful existential experiences possible– and therefore, I thought might be much too dark for me, personally, to want to finish. However, I felt drawn in immediately by the book’s beautiful cover with flying crane in a misty sky. Plus, it’s not a lengthy book, though very potent, and the story line carries you on before you know it. Robert Lesoine’s unflinchingly honest relating of the impact of the suicide of his best friend, followed by the healing journey he undertook in its aftermath, is a powerful affirmation of the value of having the time and wise guidance needed to carry on to inner completion the “dangling conversation” with a person one has lost so tragically. Co-author Marilynne Chöphel’s psychological and spiritual wisdom brings to this book a profound and compassionate grounding in how to stay supported, connected, and empowered through the grieving and healing process. Her healing exercises and body-centering affirmations at the end of each chapter, plus her supplementary “Tool Kit for Your Journey to Healing,” “Creating Support,” and “Clinical Theory Behind Unfinished Conversation’s Healing Process” appendices, add practical, tested, positively oriented ways with which to deal with the grief and loss of the suicide of a friend or family member with awareness and self-caring. I highly recommend Unfinished Conversation as a must-read book for us all as human beings seeking to be in authentic connection with loved ones ripped away from us “untimely”– and with ourselves.